Dawn Rigney has been named vice president for institutional advancement of the State University of New York (SUNY) College of Optometry and executive director of the Optometric Center of New York (OCNY), the College’s affiliated foundation, effective May 17, 2018. 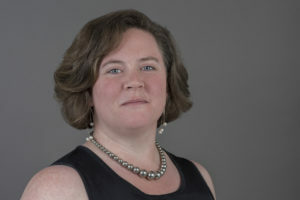 Ms. Rigney most recently served as assistant vice president of alumni and parent relations for Pace University, where she worked in several capacities since 2009. She has also served in development, annual giving and major gifts roles for the American Red Cross, New York Medical College and Fordham University, respectively, during her career. In her new role, she will provide leadership for advancement programming, including strategic planning and fiscal management. She will create and implement initiatives to secure resources for the College to maintain excellence and national leadership in its educational, clinical and research missions. Ms. Rigney earned a BFA from Emerson College, an MPH from New York Medical College and a certificate in management and leadership in education from Harvard University.